Atmospheric conditions affect how snow crystals form and what happens to them as they fall to the ground. Snow may fall as symmetrical, six-sided snowflakes, or it may fall as larger clumps of flakes. Similarly, once snow is on the ground, the snowpack may assume different qualities depending on local temperature changes, whether winds blow the snow around, or how long the snow has been on the ground. For instance, a fresh snowfall may be loose and powdery, but snow that has been on the ground throughout the winter may have dense, crusted layers caused by melting and refreezing. Scientists and meteorologists have classified types of snowfall, snowpack, and snow formations. 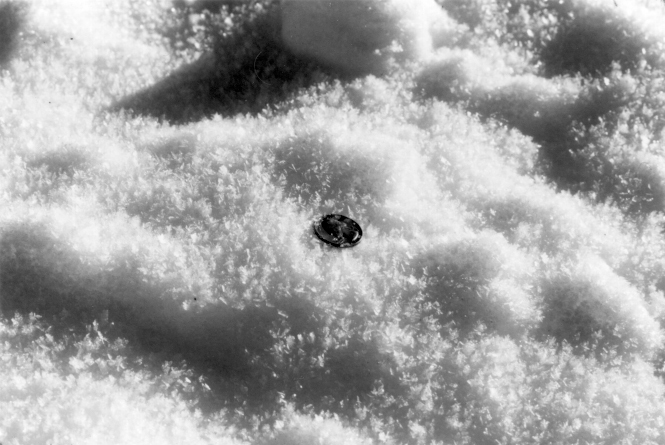 A layer of hoarfrost has formed on the surface of this snow, shown with a quarter for scale. 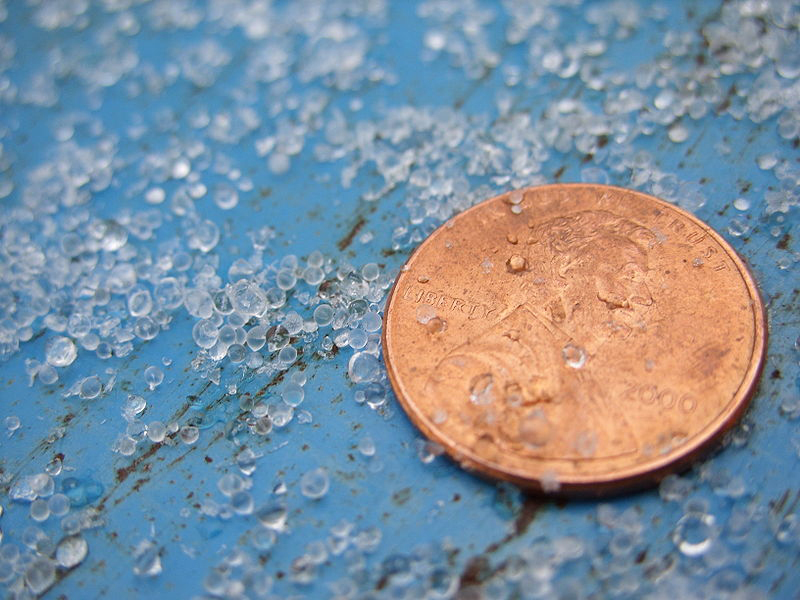 Sleet, shown here with a penny for scale, is composed of small, translucent balls of ice. Sleet is often the result of rain that freezes as it falls to the ground. Snowflakes are single ice crystals or clusters of ice crystals that fall from a cloud. Hoarfrost is the deposition of ice crystals on a surface when the temperature of the surface is lower than the frost point of the surrounding air. In this process, moisture goes directly from vapor to solid, skipping the liquid phase. Hoar frost is usually composed of interlocking ice crystals, and tends to form on objects of small diameter that are freely exposed to air, such as wires, poles, tree branches, plant stems, and leaf edges. Graupel consists of snowflakes that become rounded, opaque pellets ranging from 2 to 5 millimeters (0.1 to 0.2 inches) in diameter. They form as ice crystals fall through supercooled cloud droplets, which are below freezing but remain a liquid. The cloud droplets then freeze to the crystals, forming a lumpy mass. Graupel is sometimes mistaken for hail, but tends to have a texture that is softer and more crumbly. Graupel is sometimes also called snow pellets. Polycrystals are snowflakes composed of many individual ice crystals. 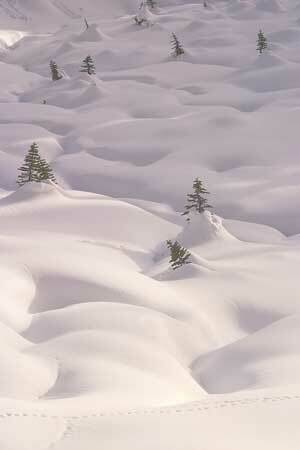 Deep drifts of snow partially envelop fir trees near Paradise River in Mount Rainier National Park. Ground blizzards, like this one in Ontario, Canada, are not the result of snowfall, but are caused when loose snow already on the ground is blown around by strong winds. A blizzard is a violent winter storm, lasting at least three hours, which combines subfreezing temperatures and very strong wind laden with blowing snow that reduces visibility to less than 0.40 kilometers (0.25 miles). A snowstorm features large amounts of snowfall. A snow flurry is snow that falls for short durations and with varying intensity; flurries usually produce little accumulation. A snow squall is a brief, but intense snowfall that greatly reduces visibility and which is often accompanied by strong winds. A snowburst is a very intense shower of snow, often of short duration, that greatly restricts visibility and produces periods of rapid snow accumulation. 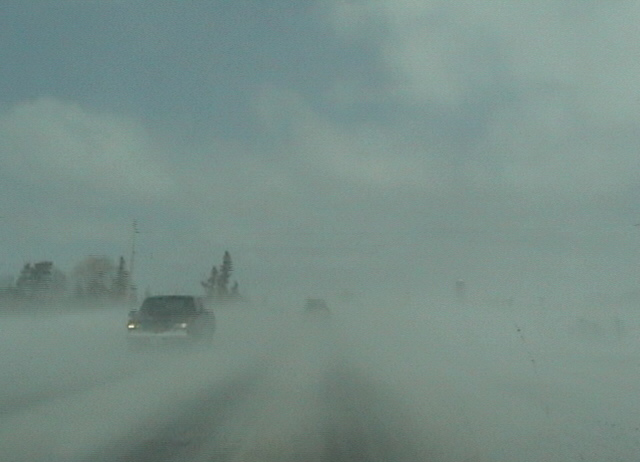 Blowing snow describes airborne snow particles raised by the wind to moderate or great heights above the ground; the horizontal visibility at eye level is generally very poor. Drifting snow is snow on the ground that is blown by the wind to a height of less than 1.5 to 2 meters (5 to 6.5 feet) above the surface. Snow cover, also called snowpack, is the total of all the snow and ice on the ground. It includes both new snow and previous snow and ice that have not melted. New snow is a recent snow deposit in which the original form of the ice crystals can be recognized. Firn is rounded, well-bonded snow that is older than one year and has a density greater than 550 kilograms per cubic meter, or 55 percent. Névé is young, granular snow that has been partially melted, refrozen and compacted; névé that survives a full melt season is called firn. This type of snow is associated with glacier formation. Old snow indicates deposited snow whose transformation is so far advanced that the original form of the new snow crystals can no longer be recognized. Seasonal snow refers to snow that accumulates during one season or snow that lasts for only one season. Perennial snow is snow that persists on the ground year after year. Powder snow is dry new snow, which is composed of loose, fresh ice crystals. 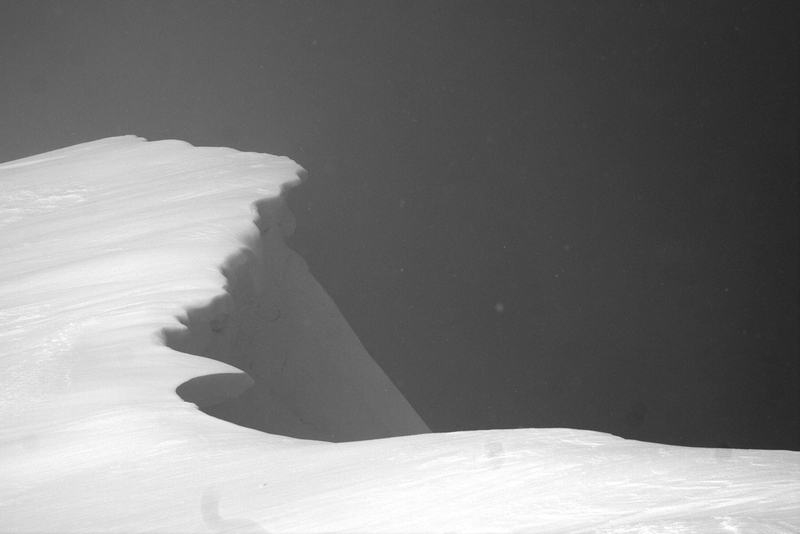 Snow cornices, like the one in this photo, are formed when wind blows snow over the edge of a ridge or cliff. In time, the snow accumulates and freezes into a cornice shape. Once on the ground, snow is subject to various weather conditions, including blowing wind, changing temperatures, and long periods of shade or sunshine. In certain instances, these elements can literally change the shape of the snow surface. A field of penitents in the Andes of Argentina. These penitents are about 1.5 to 1.8 meters (5 to 6 feet) high. A cornice is an overhanging accumulation of ice and wind-blown snow, characteristically found on the edge of a ridge or cliff face. A crust is a hard snow surface lying upon a softer layer, formed by sun, rain, or wind. Megadunes are giant dunes of snow in Antarctica composed of large snow crystals measuring up to 2 centimeters (3/4 inch) across. 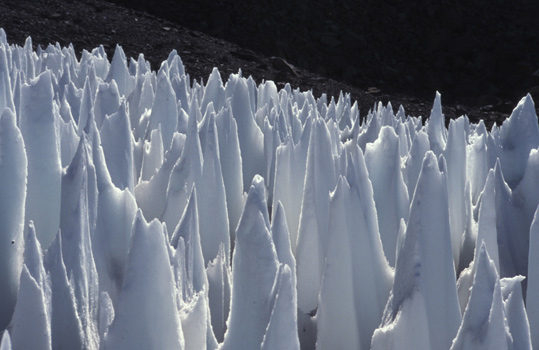 Penitents are tall, thin, closely-spaced pinnacles of hardened snow ranging in height from a few centimeters to a few meters (a few inches to a few feet). 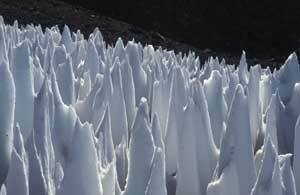 Fields of penitents can develop over glaciated and snow-covered areas, particularly in arid regions, such as the Dry Andes or in the mountains surrounding Death Valley in California. Ripple marks refer to the corrugation on a snow surface caused by wind, similar to the ripples sometimes seen in sand. Sastrugi occur when wind erodes or deposits snow in irregular grooves and ridges. Sastrugi sometimes result in delicate and fragile snow formations. A snow barchan is horseshoe-shaped snowdrift, with the ends pointing downwind. A snow bridge is an arch formed by snow that has drifted across a crevasse, forming first a cornice, and ultimately a covering which may completely obscure the crevasse. A snow roller is a rare formation that occurs during specific meteorological conditions. Wind blows a chunk of snow along the ground, and the resulting snowball accumulates material as it rolls along. Snow rollers are cylindrical rather than circular. Some are shaped like donuts because the weak inner layers collapse and blow away. Sun cups refer to a pattern of shallow, bowl-shaped hollows that form during intense sunshine. For more information see Snow Resources. Education Resources: Online map tools, video, printed, and printable materials. Photographs, animations, and more. Cryosphere Glossary: Find terms and definitions relating to snow and ice. Is there fresh snow at the ski hill? Visit NSIDC Scientist Drew Slater's site for SNOTEL station snow data in the Western U.S., updated hourly.